Announcing the winners of the 30th ever Right Place Photo Caption Contest! NOTE: A number of the caption entries this time were repeats from contest #11, the Jeepers Veepers Edition. In an attempt to keep things fresh, those that were too close to the winning entries from the other contest were set aside in favor of newer ideas. Presenting the top 15 captions for this picture from AP Photo/Charles Dharapak via Yahoo! #15: "Senator Kerry, you know I hate it when you steal my doobie." #12: We can't really infer anything from the hand gesture... I mean, is he attempting to tell us the length, or width? #11: Senator Schumer experiences just a little "agenda" envy. #10: "Well, if you must know, Mr. Vice President, mine is only this big. Explains a lot, doesn't it?" #9: "I don't care if the camera is this small, I'm right there in front of it. You can take that to the bank, Judge." 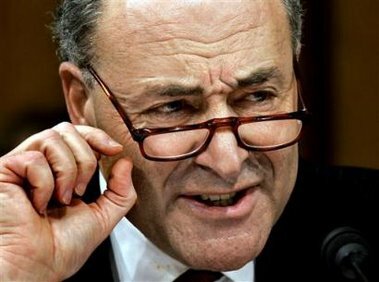 #8: "Sorry for the funny face, my distinguished collegues, but I'm currently passing a stone this size, and it hurts like a mother..."
#7: Without the handlebar mustache, Schumer's evil gesture loses some of it's impact. #6: "You are wise, Alito-san... But can you deal with the awesome fury that is... THE CLAW?!?" #5: "Well, sure the Enzyte helped, but what the hell good is it if you're hung like this?" #4: "Of course we Democrats care about National Security, Mr Attorney General. We care about it this much!" #3: "And the truth is, Democrats share this much in common with the middle class in America." #2: What has four eyes, a brain stem, a nose like a bottle opener, and mates with cameras? #1: "This is the approximate length of the leash Move-On and George Soros is keeping us on these days." IT'S HERE! IT'S HERE! SO... WHERE DO YOU RANK?? ?